NDP Leader Jagmeet Singh speaks with reporters following caucus on Parliament Hill in Ottawa, Wednesday January 31, 2018. In 2015, Mr. Singh Mr. Singh, was invited to speak at a ‘sovereignty’ rally where speakers denounced India and called for an independent Sikh state. NDP Leader Jagmeet Singh took part in a separatist Sikh homeland rally in San Francisco in June of 2015 that venerated a violent Sikh religious leader who was killed in the Indian army assault on the Golden Temple in 1984. Mr. Singh, then an NDP member of the Ontario Legislature, was invited to speak at a “sovereignty rally” where speakers denounced India and called for an independent Sikh state known as Khalistan. Mr. Singh’s appearance at the 2015 rally could have an impact in the Indo-Canadian community where all three main political parties compete for votes in key ridings in the Greater Toronto area and Lower Mainland in British Columbia. While the vast majority of Sikhs oppose extremism, the Trudeau Liberals are concerned about Mr. Singh’s potential appeal to voters of his own faith. Any suggestion that Mr. Singh favours a separate Sikh state could split the vote in a community where many still harbour ill-feelings toward India for the violent crackdown in the Punjab after the 1984 assassination of former prime minister Indira Gandhi. Videos of the event posted on Facebook and YouTube show the stage on which Mr. Singh spoke featured a large poster of Jarnail Singh Bhindranwale, the leader of an armed extremist group that occupied the Golden Temple. The militant religious leader was killed in a shootout with the Indian army after he had stockpiled weapons in the Golden Temple complex. In his speech, Mr. Singh accused India of “genocide” against Sikhs in the Golden Temple assault. The Indian government accuses Canada of being soft on extremists who agitate for a Sikh homeland that would carve out an independent state in the Punjab. The matter came to head during Prime Minister Justin Trudeau’s visit to India. A diplomatic rift opened up after it was revealed that a B.C. Sikh-Canadian convicted of trying to kill an Indian cabinet minister in 1986 had been invited by Liberal MP Randeep Sarai to a reception in honour of Mr. Trudeau that was hosted by the Canadian High Commission in New Delhi. Jagmeet Singh did not agree to an interview regarding his attendance at the June, 2015, rally but provided a statement to The Globe and Mail earlier this month, saying he was there as a “human rights advocate” and does not condone terrorism or acts of violence. He did not answer a series of questions from The Globe including whether he supports an independent Sikh homeland; why he attended a rally that extolled a violent extremist and whether he considers Mr. Bhindranwale a martyr or freedom fighter. Ujjal Dosanjh, a former NDP premier of British Columbia and federal Liberal cabinet minister, said Mr. Singh sent a “wink, wink, nudge, nudge” message by standing on a stage that included a portrait of Mr. Bhindranwale. Former Canadian Security Intelligence Service analyst Phil Gurski said Mr. Singh’s presence at a rally in support of Indian partition and where Mr. Bhindranwale is lauded should be of concern to Canadian and Indian authorities. “It doesn’t take a rocket scientist to know what this rally is about. It isn’t as if he stepped in a Boy Scout jamboree,” he said. Mr. Gurski said even if Mr. Singh did not advocate separatism or extremism in his speech, Sikh militants would use his presence at the rally to “bolster their campaign” against India. “It looks terrible and secondly it is used by these groups to say he is on our side,” he said. The Indian High Commission did not respond to requests for comment although New Delhi has long considered Mr. Singh to be a controversial figure. Mr. Singh told the June, 2015, rally crowd that he wore a round turban and flowing beard in the style of Sikhs who were “targeted, killed, massacred” by Indian authorities during the 1980s. He told the audience he initially adopted the garb and long beard to be “cool” but later decided it would send a powerful message to India. “Then I thought I would do it intentionally because if in parliament, if you see a round turban, if in parliament you can see flowing beard then you can show Indian government that ’look we are there,’ ” he said to applause. Many Sikhs consider Mr. Bhindranwale to be a martyr or freedom fighter. He is believed to be responsible for numerous killings, including the murder of Sikhs who opposed the creation of a Sikh-based theocratic state. Although Canada has a long-standing policy of supporting a unified India, Mr. Dosanjh said politicians of all stripes have frequently tolerated Sikh events in Canada where extremism is often exhibited. Annual Khalsa Day parades in Canadian cities such as Toronto celebrate the Sikh faith and draw politicians from all levels of government, from Liberal Prime Minister Justin Trudeau to Toronto Mayor John Tory to former Ontario Progressive Conservative leader Patrick Brown. Some of the parades in the past have featured a float glorifying Mr. Bhindranwale and other controversial figures while politicians have also attended events at temples that are known to have pictures displayed of Sikh extremists. According to Indian media outlets such as The Hindu, the Indian government later protested Mr. Trudeau’s 2017 appearance at the Khalsa Day events in Toronto. “If you support one India then why do you associate yourself with parades and temples that glorify those that want to dismember India,” Mr. Dosanjh said. Successive Canadian prime ministers including Stephen Harper and Mr. Trudeau have made a point of visiting Punjab’s Golden Temple – an important spiritual site for Sikhs – during visits to India. “It’s all about domestic politics,” says University of Toronto political science professor Nelson Wiseman. 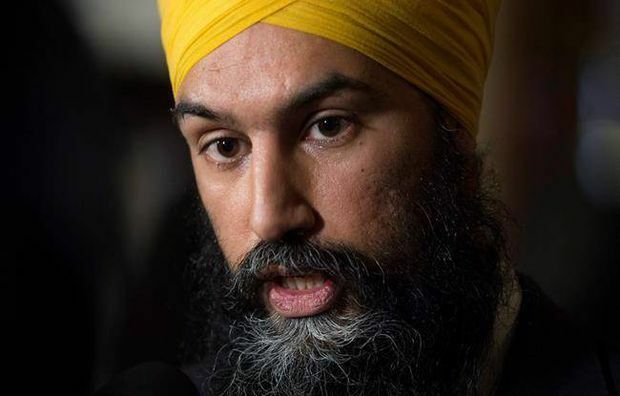 Recently the NDP Leader spoke out in defence of Liberal Sikh-Canadian cabinet ministers who had been photographed with Jaspal Atwal during the Prime Minister’s recent visit to India. Mr. Atwal is the B.C. man who was convicted of the attempted assassination of an Indian politician in 1986. Mr. Atwal is a former member of the International Sikh Youth Federation, a banned terrorist group in Canada and India, which wants a separate homeland for India’s Sikh minority. He was also charged but never convicted in the brutal 1985 beating of Mr. Dosanjh. Mr. Trudeau’s national security adviser, Daniel Jean, told reporters in a background briefing last month that factions within the Indian government had sought to sabotage Mr. Trudeau’s February trip to India. He suggested that Mr. Atwal had been part of the Indian operation. The Indian government flatly denied the conspiracy allegation and the opposition parties claimed Mr. Jean was ordered to put out the story to deflect criticism over the Atwal incident. Former Canadian Security Intelligence Service director, Richard Fadden, who had also served as Mr. Trudeau’s national security adviser, said he did not believe the Indian government or its spy services would engage in such conduct.